You’ve taken your IU education and experiences into the world. The Indiana University Alumni Magazine brings the IU world to you. The quarterly publication celebrates the achievements and happenings of the university and your classmates. It also offers you real-world advice and investigates real-life topics through the lens of IU experts and alums. 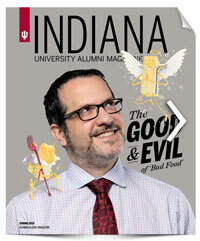 As a member of the IU Alumni Association, you’ll see the magazine in your mailbox. You can also enjoy it online! Reflections from Pulitzer Prize-winning alumni, advice and resources for jump-starting your career, stories of how IU is shaping the world—you’ll find all of these and more in recent issues of the Indiana University Alumni Magazine. Sign in to view current or past issues.